When my wife and I first got our Prius, we had a very difficult time getting the car to turn on. Now, this seems like a completely simple issue. Put in the key, right? Well, our Prius has a button on the dash that says “Power” instead of a key. Unfortunately, if you push that button without having a little keychain in your pocket, it won’t work. Even stranger, if you push it with that keychain in your pocket and haven’t pressed down on the brake, you’ll just get the auxiliary power. How did I figure it out? I read the manual. Those of us who have owned a car for a while generally feel pretty confident about how the thing works. Put in the key, put it into drive, and go, right? Who needs the manual for that? In truth, a car manual is loaded with useful things, particularly if you’re new to that model of car. It tells you how exactly each feature works on the car, for starters. After my experience with the Prius, I spent about an hour sitting in our Pilot after we purchased it, trying out all of the features just to see how they worked. Let’s just say I never found myself wondering how the emergency brake or the windshield wipers worked during the moments when I needed them. The manual tells you lots of little useful facts, like the recommended tire pressure (invaluable for when you air up your tires) and the details of your warranty. It tells you the maintenance schedule (something I’ll talk more about in the next few days), where the tools for changing a flat tire are, and how exactly to turn on your flashers. It describes how to change the oil yourself, how to replace the windshield washing fluid, and how to change the transmission fluid. Every single one of those things will save you time and money. Often, that time and money will be saved during a key moment when time and money are of the essence. All it takes is some time spent right now reading the manual and trying out the things described in it. 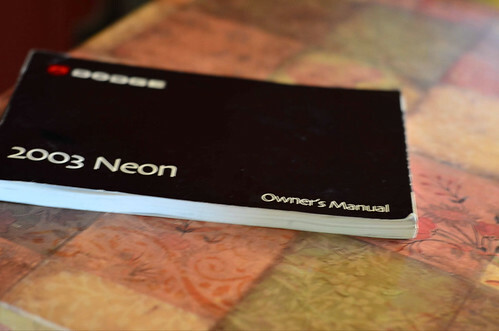 Your car manual is a giant recipe for relieving car-related headaches. Take advantage of it.